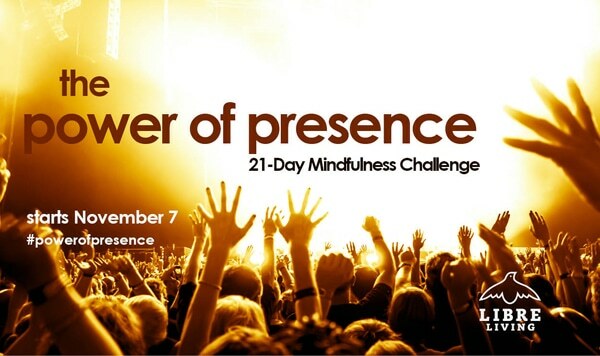 This 21-Day Mindfulness Challenge is about arriving in a state of powerful presence, a state where we move out of the sinking feeling of Quicksand and into the strength, calm and ability of the Power of Presence. Mindfulness can get us there. In any situation, at any time in your life, mindfulness can be the pathway and the practice to move you out of overwhelm and stress and into strength and peace. This 21-Day Mindfulness Challenge will introduce you to mindfulness, help you see where you are lacking it, and teach you the most powerful ways to bring it into your life, exactly where and when you need it. 21 Days of daily challenges, straight to your inbox. Do you want to feel less overwhelmed? Do you regularly experience times where you worry more than you take positive action? Do you feel like you are spinning? I’ve been there–it used to be my home base, my default way of being. I was overwhelmed, stressed, felt anxious, had aches and pains in my body, and constantly felt like I was reacting instead of creating what would be ideal. Fast forward seven years, after realizing the power of mindfulness and practicing it daily in my every day life, and now it’s like night and day. I don’t even recognize the person I used to be. Now I live mainly in a state of calm, strength and vitality, creating what’s ideal instead of just managing to handle what comes up. Mindfulness was one of the first steps I took to get here. During this challenge, one daily challenge arrives in your inbox, starting November 7. Exercises, intentions, activities for you to do. All designed to help you bring mindfulness into your life and activate the power of presence. in the Libre Living Challenges.